Despite the unseasonably warm and balmy outdoor conditions in central Ohio this year, it is technically still winter. Usually the March weather is much more winter-like and the tender bulbs blooming in the greenhouse provide a welcome retreat from the typically wet and raw weather of the season. Although spring has come exceedingly early this year, this has only expedited and condensed the flowering season of the tender bulbs in the greenhouse. Many of the finest are only now producing flowers after producing foliage through the late fall and winter. 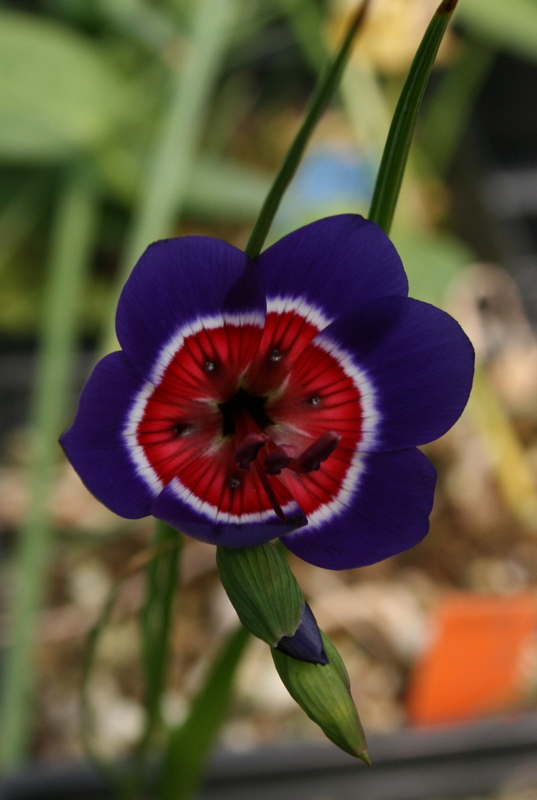 The highly sought after Geissorhiza radians, or wine cup. Under my conditions, plants must be hand-pollinated and regenerated from seed on a regular basis. Individual plants mature and flower relatively quickly from seed and are short-lived. Looking very similar to G. radians is Babiana rubrocyanea. A case if convergent evolution? Affinity for similar pollinators? Whatever the case, the similarity between two distantly related species is startling. Switching gears, but staying within the Iridaceae, we have Ferraria crispa with its bizarre, sea-creature-esque flowers that are intensively fragrant and reminiscent of vanilla. 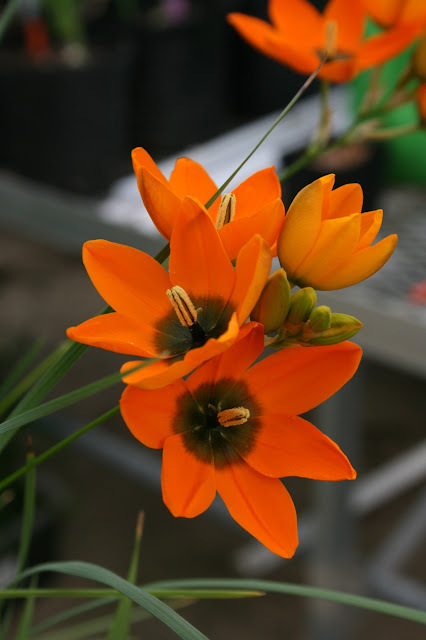 I especially like this orange-flowered Ixia curta that was given to me by a friend and long-time grower of South African bulbs. This plant consistently flowers in March on tall, wispy scapes. The contrast between the bright orange of the petals and charcoal-green central blotch is eye-catching from a distance. This plant was given to me as Moraea tuhlbagensis x M. villosa, but it very closely resembles the plant called M. villosa ssp. elandsmontana, a very rare species of the western cape. Whatever it's name may be, represents another unique and indescribable color combination.The likes of which seem to come only from South Africa. A few of the earlier, hardier bulbs have started to flower. Crocus sieberi ssp. sublimis 'Tricolor' should really called 'Quadricolor'. This is a very richly colored plant that I like quite well. Iris reticulata 'Halkis'. In our climate, I. reticulata and related species do very well outside in normal garden soil, and should not be tortured in containers. When I try to grow them in containers, they only shrink in size. I put this picture here to remind myself of that. This is a beautiful from Janis Ruksans that was collected by Norman Stevens on Halkis Dag in Batman province, Turkey in 1990 (per Janis' catalog).